YaPIDE aims to be a fully featured Microchip PIC simulator for Linux (and probably other UNIXes). 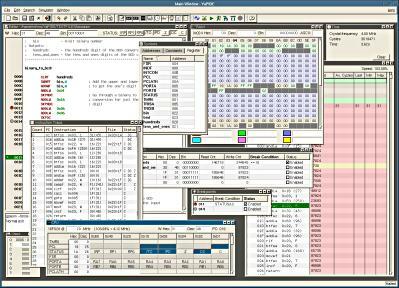 YaPIDE is a GUI only application. If you need a commandline based PIC simulator there is the excellent GPSIM. Emphasis was put on both simulation speed and GUI spiffiness. GUI and simulation run in separate threads. The following GUI features are currently implemented. YaPIDE has been tested on several Linux systems. Simulation speed was something between 15MHz (Pentimum III M 933MHz) and 112MHz (AMD 64 2.2GHz). This of course is heavily dependant on the number of used features of the simulator (Timers, GUI windows ...). YaPIDE is released under the GPL and was developed from scratch by Matthias Toussaint. YaPIDE is in an early larval stage but already usable, but don't expect it to be ready for your next one million € project. Please don't forget to read, understand and agree to YaPIDE's license before using it. You might have to shift click the link. YaPIDE comes in a source-only distribution. Compilation is simple. Now you'll find the executable yapide in the YaPIDE/bin directory. Put it into your $PATH and you are done. YaPIDE is licensed under the terms of the GNU GPL. This program is free software; you can redistribute it and/or modify it under the terms of the GNU General Public License as published by the Free Software Foundation; either version 2 of the License, or (at your option) any later version. This program is distributed in the hope that it will be useful, but WITHOUT ANY WARRANTY; without even the implied warranty of MERCHANTABILITY or FITNESS FOR A PARTICULAR PURPOSE. See http://www.gnu.org/copyleft/gpl.html for more details. is copyright by Free Software Foundation, Inc.
is copyright by Microchip Technology Inc.